I know similar posts have been posted on bigger and better blogs than mine, but I wanted to personally show you how using Pinterest can work to grow your blog. Do you remember this post from two weeks ago? Since my recipes are some of my more popular posts, I decided to start putting them on my Pinterest boards in an attempt to get more traffic to my blog. Well, it went viral and got tons and tons of pins. 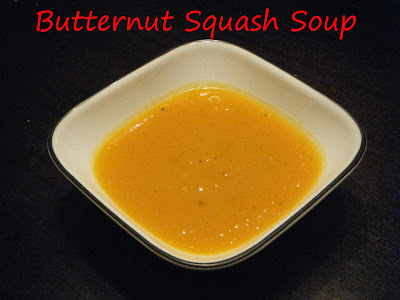 It is now my most popular post and is the number four recipe listed when you search for butternut squash soup on Google. An added bonus is that my blog is being exposed to new readers who otherwise may never have visited. Who knew butternut squash soup was so popular? If you aren't already pinning images from your posts to Pinterest, I highly recommend to start doing so. A few other things I would suggest are to periodically change the order of your boards on your profile to make sure that the top two rows are relevant to those who may be looking at them. For example, since it's currently fall, I have my fall board up there and will switch it to Christmas after Thanksgiving. I also make sure that my boards pertaining to things I blog about regularly are up there as well. Pinterest is truly an underused resource. You never know how far it can take you! So true! The same thing happened with my Arbonne protein bars...it blows my mind because it was one of my first posts ever...but to this day I get tons of new hits from it! You are SO right! I recently starting pinning my recipes more and even being mindful to take shots vertically (since that's what Pinterest prefers) to draw followers in! My most popular posts are as such thanks to Pinterest! Isn't it crazy? I have always focused on using Twitter and Facebook to draw traffic. While I do get some from those outlets, I have by far gotten more for certain posts through Pinterest! You should try it if you aren't already doing so! I very rarely share anything worth pinning, but I do pin when I can! I've had limited success. I have one pin on pinterest that seems to be doing very well it has about 14 pins which is great for me because I am so new to blogging but I would be incredibly happy if I could manage to have a viral post on pinterest! That's so exciting! I need to start pinning more of my own stuff! I really didn't expect it to happen. Especially with butternut squash soup! You should! Like that pumpkin you painted :-) It's seriously cool! You should! Recipes, crafts, decorations, fashion anything like that can catch on like wildfire.